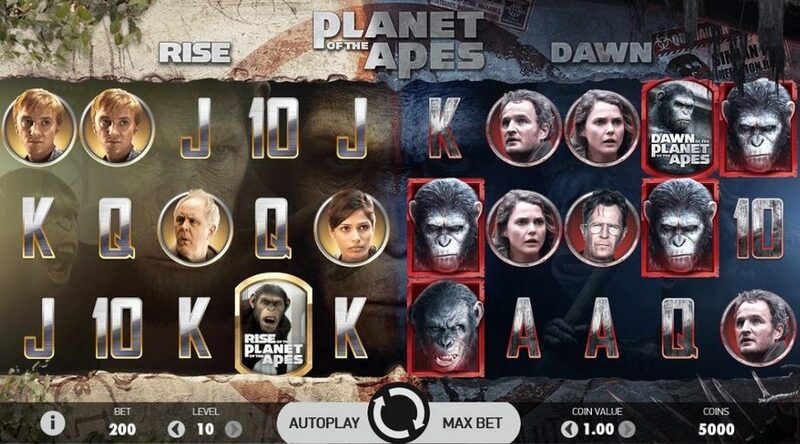 Planet of the Apes is the latest online slot game brought to you by casino games provider NetEnt in association with 20th Century Fox. Based on the two movies – Rise of the Planet of the Apes and Dawn of the Planet of the Apes – the game takes the player on a journey between the two different phases of the Ape Army leader Caesar’s life. The classic graphics, with human and ape slots symbols, recreates the famous film characters. This can activate randomly on any spin. If the Dual feature is triggered, one symbol of slot is chosen for each play area with the same symbol not able to be chosen for both play areas and Wild and Scatter symbols also unable to be chosen. The reels only contain these two slots symbols, the rest of the reels are blank spaces. If a symbol lands in its corresponding play area when the reels stop, it sticks. If a symbol lands in the other play area, it transfers over to the correct play area into the corresponding position. If at least one new symbol appears in its corresponding play area, the game re-spins which continues until now new symbols land on a re-spin. Each of the dual reels has its own base game features and Free Spins with a particular twist. 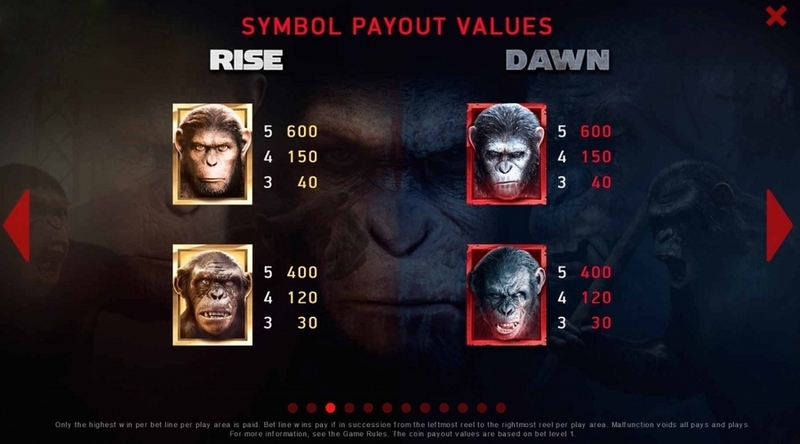 The Rise Bonus feature is an additional coin win that is awarded for every human and ape symbol displayed on the screen except for the Scatter symbol and only appears on the Rise play area. Rise Free Spins: During the feature only the Rise play area is active and the number of Wild symbols that land on each spin are collected in a Wild meter on the screen. Each Wild symbol landing on reels will add to the meter by 1. On the last spin, after the reels stop spinning (but before any wins are evaluated) all collected Wild symbols are randomly placed on the play area and, once this has finished, the win will be evaluated. The Dawn Bonus feature transforms ape and human symbols into the same symbol and only appears in the Dawn play area. Dawn Free Spins: During the feature only the Dawn play area is active with 3 different collect symbols that activate a corresponding meter: Multiplier, Extra Wild and Extra Free Spins. When a collect symbol lands, it fills the corresponding meter by 1. When the meter is full, it activates a feature with each meter requiring 3 slots symbols to become full. The Extra Free Spins meter awards 3 extra Free Spins every time it is filled. The player starts the Dawn Free Spins with multiplier 1. Each time the Multiplier meter is filled the multiplier is increased by 1, until the x5 multiplier is reached. The current multiplier/Wild symbol will be highlighted on the game screen. The Extra Wild meter turns one of the human symbols into an Extra Wild symbol every time it is filled for the remainder of the Free Spins. 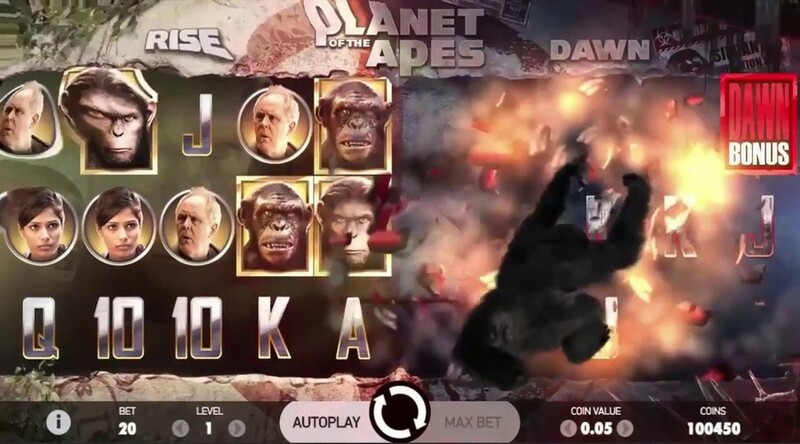 Planet of the Apes is a really entertaining and suspenseful video slot game by casino games provider NetEnt. The online slot game will releas on 23rd October 2017.